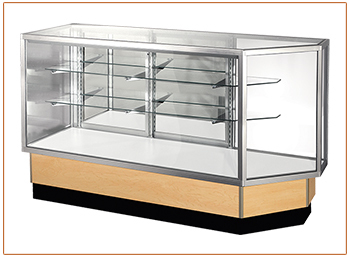 The overall dimensions of a standard Full Vision showcase are 38” high and 20” deep. The glass case is 26” high and 20” deep. The recessed wood base is 8” high and 17.5” deep. The black kick base is 4” high. Cases come with one row 8” deep and one row 10” deep shelving with an angled corner. When lined up with other Full Vision showcases, the base and shelving matches adjacent cases.